today at 12:53 pm louisiana time we just happened to look out the kitchen window to notice that our fave hummingbird was buzzing around the spot where we always hang our feeder. now this is interesting because the hummingbirds in years past usually return around 17 march - we noticed they didnt return last year until 01 april because like this year we had some late cold snaps. there is no way you can tell us that they dont return to the same place every year - how else would they know to come to the exact spot where the feeder was hanging last year? anyway heres how to make hummingbird nectar - mix 1 cup sugar to 4 cups water stir until dissolved. there is no need to boil the water but you can if you want to. DO NOT! add food coloring to the nectar as that is unhealthy to the hummers and might kill them. 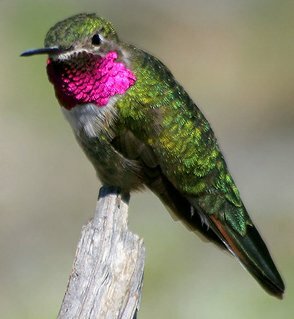 the red color of the feeder is what attracts them, not the color of the nectar. now soon you too will be able to enjoy the massive air wars around your place.